While Dungeons & Dragons has always been and will likely always be my favorite game of all time, it is not really what most would consider a traditional board game. 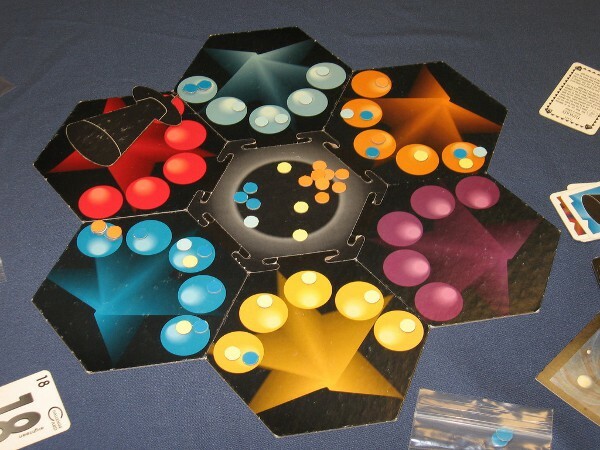 While the subject of this month’s Game Night Blog Carnival entry is not what I consider the best board game, or the most balanced, or even the most mechanically interesting, it is undoubtedly my favorite. Cosmic Encounter has been one of the most heavily played games in my collection for almost two decades. In 1994, Magic: the Gathering was all the rage. I played that game heavily (and still play some today), and probably should write about it someday, but at this time in my life, I was voraciously devouring any and all information about the game. I was reading an interview with Magic’s creator, Richard Garfield, in Dragon Magazine (if memory serves me right). Garfield mentioned two games as being influential on Magic’s design: Wiz-War (another game I should write about) and Cosmic Encounter. As a rabid fan, I promptly sought out copies of both, and grew to love them both, but especially Cosmic Encounter. 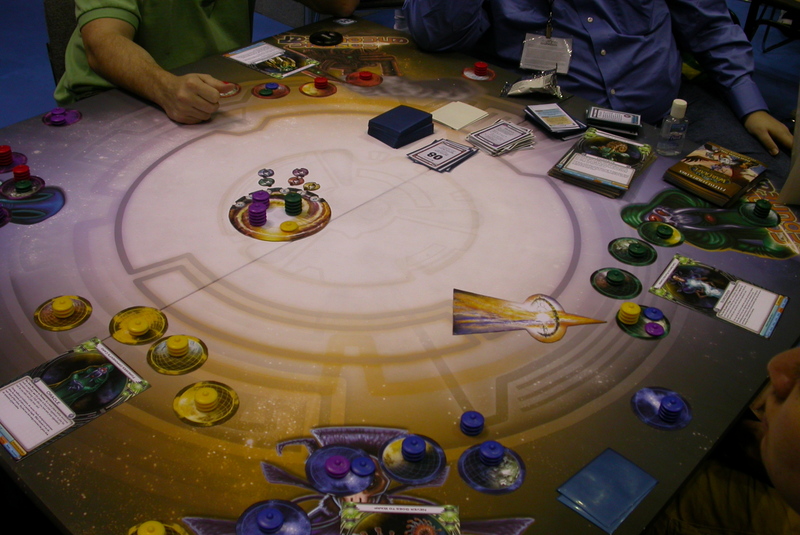 Cosmic Encounter is a game with a long and varied history. Originally created in 1977, it has been popular enough to remain in print for most of the time since. I purchased the Mayfair edition in 1994, played it voraciously during my college years, then sold it for an outrageous price on Ebay shortly after I got married. In 2002, I obtained the Avalon Hill edition, which had amazing artwork and extremely detailed components, but a shortage of alien races. It was still fun for me and my kids to play, but when Fantasy Flight’s updated version was released a few years ago, with more aliens and cleaner rules, I didn’t delay long in picking up a set. This version hits my game table on a regular basis, but not nearly as often as I’d like. At its core, Cosmic Encounter is a simple game. Each player takes on the role of an alien race bent on galactic conquest. Each player controls a home system of five planets, and an armada of spaceships. The object is to be the first player with five colonies in other players’ systems. The Mayfair edition; you never forget your first! Combat is card driven, with each player playing a card, adding in the number of ships on each side of the fight, and comparing totals. If the offense wins, they gain a colony. If the defense wins, they fight the invaders off. The choice of where to attack each turn is controlled by drawing from the Destiny deck. Other cards, like artifacts and kickers, add to the variety, but the actual mechanics of combat are elementary. The complexity of the game, and its greatest appeal, is in the alien races. Each race has a special power that allows it to break the rules of the game in some way. The Macron is a good example; each Macron ship counts as a value of four. Thus, they are very difficult to dislodge from their home bases, and lose far fewer ships even on offense. Another good example is the Sorcerer. 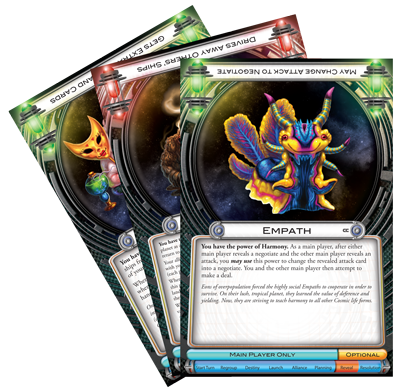 These tricky aliens can swap their combat cards with the opponent if they choose. Other alien powers are not as obviously strong, like the Parasite, who can choose to ally with a player even when not invited, hoping to snag a low-risk colony or more cards in the process. The Fantasy Flight edition of Cosmic Encounter includes fifty alien powers, which allows for thousands of potential combinations. Each new game brings a totally different gameplay experience as a result. Often, alien powers that are strong in one context are weakened by the inclusion of other powers. For each alien race, a special flare card is shuffled in the deck, which allows for a one-shot, extremely powerful effect when used by the appropriate alien. The sheer variety in the card selection, alien powers, and number of players (up to eight with all expansions) provides a replayability factor higher than almost any other game in my collection. Politics and table talk are a huge part of the Cosmic Encounter experience. Both sides of any battle can choose to invite allies, and allied ships count towards each side’s total. Begging for help from your neighbors when the odds are against you often works well. Then again, there’s always the chance your ally will throw the battle on purpose, causing you to lose precious ships to the warp! The inclusion of Negotiate cards allows for deal-making between players, as well. The social elements of the game truly shine, and many epic, memorable situations occur that will be the talk of your gaming group for weeks if not months. I should also mention an anecdote from my childhood that is tangentially related to Cosmic Encounter. In my early teenage years, I really enjoyed the books of William Sleator, a prolific science fiction author who wrote for young adults. One of my favorite stories of his was Interstellar Pig, in which a teenaged boy was introduced to a unique board game by his mysterious neighbors. In this game, each player took on the role of a different alien race, with varying powers and abilities. When I played Cosmic Encounter for the first time in the early 90s, I was struck by the resemblance to the game in Interstellar Pig. Whether Sleator was familiar with the original version of Cosmic Encounter before Interstellar Pig’s publication in 1984 or not, the similarities are quite uncanny. 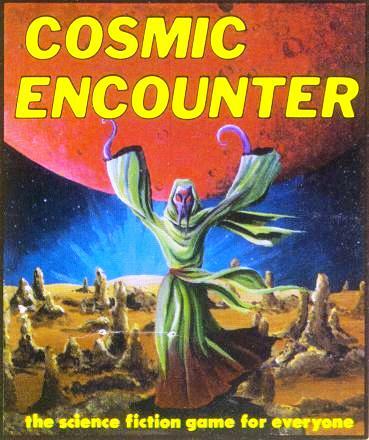 I suppose the appeal of Cosmic Encounter for me is partially due to this resemblance to a beloved book from my past. 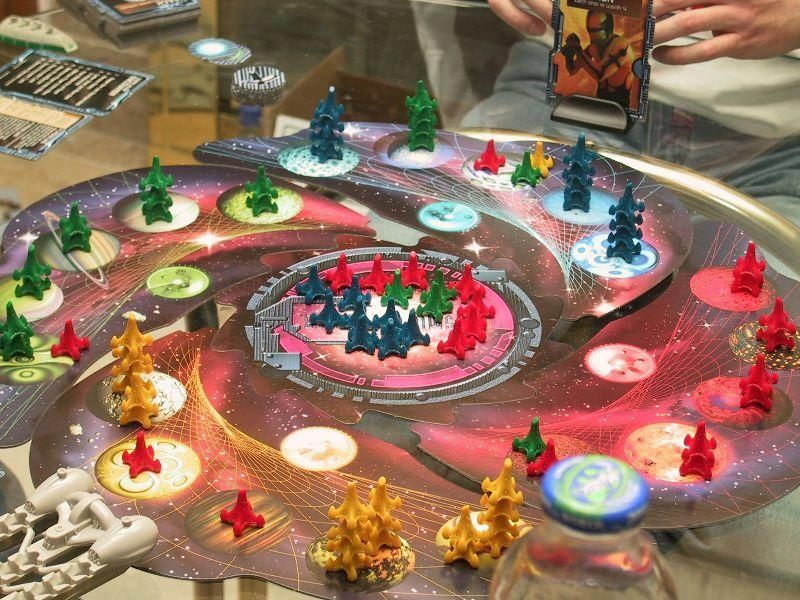 If you enjoy board games in any capacity, you absolutely must give Cosmic Encounter a try. I have played it with Euro gamers, wargamers, Magic players, and even those who only have Monopoly or Scrabble in their gaming closet. There are aspects of the game that appeal to each of these varying groups: the thrill of competition, the social element, and the sheer scope of the replayability. Cosmic Encounter may not be the greatest board game ever, but it’s not too far from the top of that list.